· Prepare Your Meals at Home as much as possible. That’s a huge challenge given our busy lifestyles and the number of fast food options available while we’re out on the go, but it’s important for our children to see us championing our own diets, by preparing meals in a space where we’re in total control of the ingredients. To this end, make the kitchen a social space and include your child in the dinner making process, showing them the choices you’re making and why you believe those are important ones. If possible, prepare their lunches ahead of time at home, too. And always be thinking about what healthy ingredients you can slip into a recipe. For example, orange juice makes a great marinade and cauliflower can replace many unhealthy starches. · Swap the highly processed Sports Drinks for Healthy Juice: While teaching kids the importance of hydration, especially if they’re active outdoors or in school sports, set an example of drinking water and nutritionally sound juices. 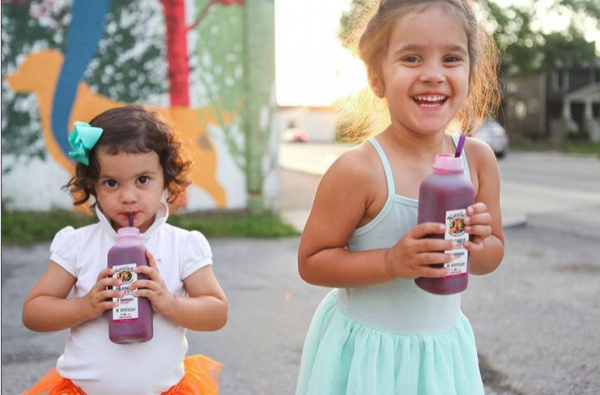 “Minimally processed juices, that are free from artificial ingredients, are great for recovery, yet our go to for kids is often a sports drink” according to juice expert, Natalie Sexton, whose company Natalie’s Orchid Island Juices produces several juices suitable for sports recovery. She suggests we teach our kids how fruits and vegetables are nutritional powerhouses that can fuel their athletic success. · Be a Nutritional Role Model: It may seem awkward at first, but make a big deal, in front of your kids, when making any food choices. Let them see you reading nutritional labels at the grocery store, extolling the health benefits of your picks in the produce aisle, asking the wait staff what the healthier menu choices are, when you do out eat out. The most important thing you can do to help your child develop healthy eating habits is by setting the example first. And make this lifestyle choice known to teachers and other parents your child will interact with. · Sneak in Healthy Options: If you do find yourself facing a child who’s a bit finicky when it comes to eating fruits and veggies, look for creative ways to introduce these items into your child’s diet. Juice can be used for homemade ice pops, cauliflower can be mixed into mashed potatoes – and eventually replace it, introduce them to smoothies you create using frozen fruits and have a spaghetti night that uses squash or zucchini as a pasta replacement. Freezing grapes for kids and calling them something clever like “grape cream ice balls” just might do the trick! Whether they like it or not, kids do eventually grow up to be like their parents. By demonstrating good food choices in front of them at an early age, you can imprint invaluable healthy habits that will lead them into a more fulfilling and active way of life. I work at Olympus Labs, a crypto currency financial services company. I also write for Equities.com and Buzzfeed.